(Ricky Ricardo [Desi Arnaz]) – Say, Lucy! 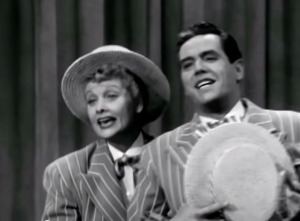 (Lucy Ricardo [Lucille Ball]) – Yeah, Ricky! (Ricky Ricardo [Desi Arnaz]) – You know a funny thing happened to me on the way to the theater tonight. (Lucy Ricardo [Lucille Ball]) – What? (Ricky Ricardo [Desi Arnaz]) – A tramp came up to me in the street and said he hadn’t had a bite in weeks. (Lucy Ricardo [Lucille Ball]) – What d’ya do, bite him? (Ricky Ricardo [Desi Arnaz]) – Eh, did you hear about the big fire down in the shoe factory? (Lucy Ricardo [Lucille Ball]) – I’ll bet some heel started it! (Lucy Ricardo [Lucille Ball]) – Huh? (Ricky Ricardo [Desi Arnaz]) – What happened! (Lucy Ricardo [Lucille Ball]) – Two hundred soles were lost! (Lucy Ricardo [Lucille Ball]) – Go ahead. (Ricky Ricardo [Desi Arnaz]) – I’m onto your tricks. You start it this time. Go ahead. (Lucy Ricardo [Lucille Ball]) – Okay. You know there are two things I can’t eat for breakfast: lunch and dinner. (Ricky Ricardo [Desi Arnaz]) – I got you this time. I got a joke that you never heard in your whole life. (Lucy Ricardo [Lucille Ball]) – Okay. Go ahead. Spill it, brother. (Ricky Ricardo [Desi Arnaz]) – Did you hear about the girl that was so dumb that she thought a football coach had four wheels! Ha ha ha ha ha! Four wheels! (Lucy Ricardo [Lucille Ball]) – Ha ha ha ha ha! How many wheels does it have? (Ricky Ricardo [Desi Arnaz]) – Oh, what’s the use! Lyrics to Mother, What Do I Do Now?